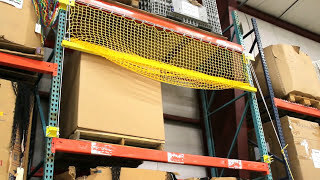 InCord is a manufacturer of protective guarding products for material handling and warehouse storage, including protective safety netting used for rack, conveyor and mezzanine guards. From large mesh netting systems for pallet constraint to small mesh and solid liner material used to contain debris and liquids below conveyors, InCord has a netting solution for every fall protection need. In addition to industrial and material handling applications, InCord serves every netting need for the construction, automotive, amusement and sports industries. InCord stocks over 10 million square feet of netting in dozens of configurations, mesh diameters and colors for the widest range of custom applications from safety to theming.